I’ve been experimenting with flexible wraps since I posted an article about the potential dangers of flax, a common ingredient in many gluten-free wraps, breads, and tortillas. The original post is here. I wanted a replacement that would taste great, be easy to make, low in carbs, and flexible enough to use for tacos and sandwiches, but free of plant estrogens and toxins. It took a lot of tries, but I’m very pleased with this recipe. No kneading or rolling and they have only 1.6 net carbs each! In a medium mixing bowl, whisk eggs until blended. Add low-carb milk, water, and melted butter, tallow, or oil. In a second bowl, whisk together almond flour, coconut flour, psyllium powder, xylitol, and salt, pressing out any lumps. Grease a 6- or 7-inch crepe pan or small skillet. (Two pans that you can alternate will speed things up since you have to let them cool between wraps.) Pour 1/4 cup of batter in cool pan. Turn and tilt the pan to spread the batter. 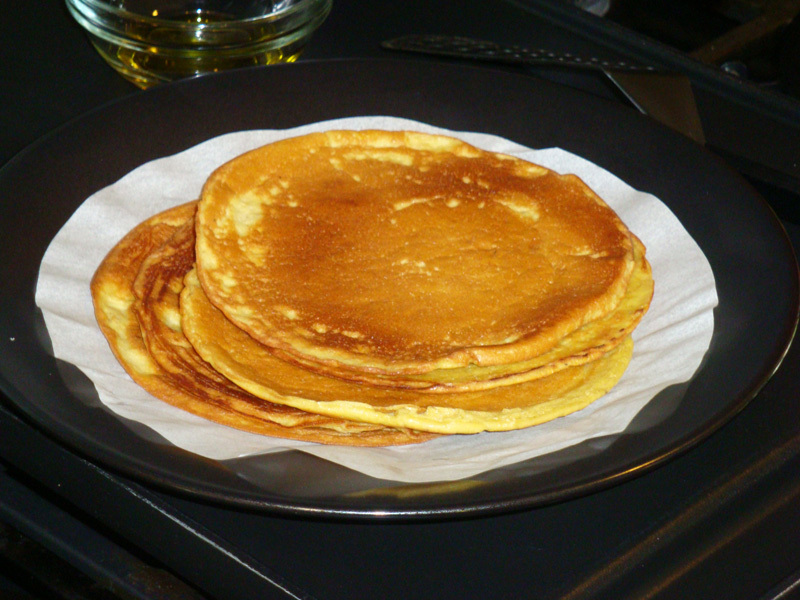 Set pan on a flat surface for a minute or so until the batter covers the bottom in an even layer. Place pan over medium-low heat and cook until top of wrap losses its sheen and just starts to brown around the edges. (If the batter gets bubbles that burst and leave holes, your pan is too hot. Patch holes with a drop of batter and lower the heat.) With a spatula, gently loosen around the outside edges and work the spatula under the wrap from the perimeter to the center until it is completely loose. Don’t force the spatula if there is any resistance or it will tear. It will release easily when it is done. Turn and cook other side until lightly browned. Remove to a plate. Set the empty pan on a stone countertop or a wet towel to cool quickly before making another wrap or use a second pan. Brush pan with more fat, add batter, and cook as before. Remove cooked wraps to plate, separating with parchment or paper towels. Use to make wrap sandwiches and Mexican dishes or like crepes for desserts. Makes 5 to 6 wraps. Replace 1 tbsp of almond flour with 1 tbsp cocoa powder and double the sweetener. Fill with fresh berries, roll up, and top with whipped cream OR spread with sugar-free jam and/or nut butter, fold into quarters, brown in butter, and dust with granulated sweetener. Crepes, Easy Recipe, Flax-free, Psyllium, Wheat-free, Wraps. Bookmark. I'm startled to see that flax is actually more estrogenic than soy!! Thank you for bringing this to our attention. So in your experimentation, have you found that psyllium husk can be used as a 1:1 substitute? So many great low carb recipes call for flax meal, and I quite like psyllium husk! Hi luluweezie. I wouldn't recommend just replacing flax with psyllium. I did a lot of testing to get this recipe to work. It's better to start with one that already calls for psyllium. If you want to experiment and test it yourself, please let us know how it works out. Thanks for the comment! Hey Judy….Anne Bailey again….I love this recipe, and I have tons of psyllium for when I am baking. Right now I am trying to lose weight and in the Keto paradigm, fiber can stop fat burning. So I just whip up 4 eggs and about 2 cups of cooked and cooled cauliflower rice, with a 1/2 tsp baking powder and 1/2 tsp salt. I spread it out on a toaster oven parchment lined pan and let it bake an hour or less. It puffs up slightly during baking, then settles down again. I usually let it cool off in the oven overnight. It is perhaps not strong enough to wrap a whole sandwich, but I like to make smaller "tacitos" with it, often layered with romaine lettuce for extra strength. I think it would also make a decent crepe when warm. Hi Anne. Thanks so much for posting your recipe here! It sounds so simple and easy–I'll have to give it a try! I want to try this recipe but I can’t find the psyllium powder. Is there something I can substitute for it? Thanks. Hi Zach F. Sorry to be so late replying. Phyllium is the same thing as Metamusil, which is sold as a laxative. It is better to buy another brand, however, as Metamusil can be gritty when used for cooking. I use one made by Frontier that I order it from Amazon, but there are other brands that may be as good.